Description Weighted metal base plate, powdercoated Black. The base plate is 12.4 kg and comes with a detachable spinner, peg holes and rubber feet. Supplied with pegs, allowing the base to be pegged into the ground if required. The Heavy Duty metal base plate is powdercoated Black. The base plate contains holes, allowing it to be pegged to the ground if required. 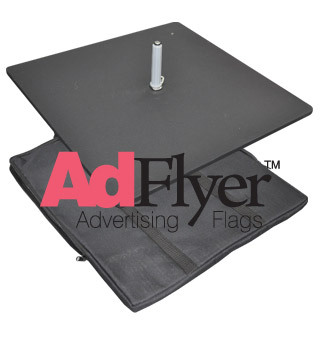 The base plate is perfectly weighted for use with the AdFlyer Teardrop and Feather flags. The base plate is supplied in a carry bag for easy transportation. All parts are included to get you started with the AdFlyer series of Teardrop and Feather flags.